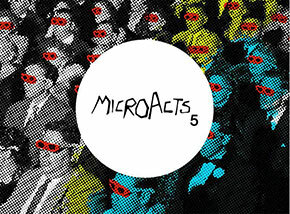 I’m delighted to announce that I will be previewing a new collaborative film at MicroActs 5 Artist Film Screening. The film is from part of a project titled ‘MyMe’, made in collaboration with the artists Antonis Sideras and Liz Morison, and this segment is called ‘Troupe Colours’. Tickets can be booked via Eventbrite (free entry) or just turn up on the night.